There are now more people surviving and living well after cancer treatment than ever before. Yet in general, cancer survivors face the possibility of cancer recurrence and have a slightly increased risk of developing another cancer compared to those who have never been diagnosed. If a cancer returns to the same area years after treatment, it is called a recurrence. If a cancer develops in another part of the body, it is a secondary cancer. The risk of recurrence or a seconday cancer depends upon many factors, including the type of cancer and age at diagnosis. The risk of another cancer developing is relatively small. Research shows that overall, one to three percent of cancer survivors will develop a secondary cancer. As a cancer survivor, the fear of recurrence and developing another cancer can be stressful. Talking with your healthcare team may help you manage this fear. What causes some individuals diagnosed with a cancer to develop another cancer is unclear. That's one reason it's important to take steps to reduce your risk. Taking active steps like choosing a plant-based eating pattern, engaging in physical activity, and following up with your healthcare team about your survivorship plan can help. Of course, taking all the precautions and following healthy living steps is no guarantee you will live cancer-free. Just like not following every recommendation to lower your cancer risk does not mean you are to blame if a cancer does develop. Choose to do what you can, when you can. 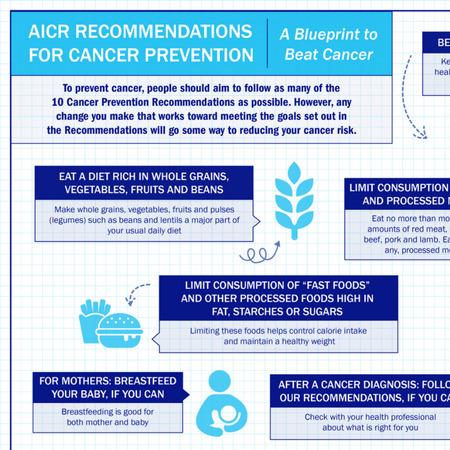 After treatment, AICR recommends that cancer survivors follow our recommendations for cancer prevention when and if you are able to do so. These recommendations also reduce the risk of other chronic diseases like diabetes and heart disease. Based on the global review of the research, here are the steps linked to lower risk of the most common cancers. AICR is here to help throughout your treatment and after it is completed. AICR's CancerResource: Living with Cancer is a free handbook on eating and being active both during and after treatment. It was developed with an Advisory Committee of experts. You can download the handbook for free. To see inside pages and purchase a hardcopy of the handbook, visit our store. Visit our Healthy or Harmful section for answers to frequently asked questions.